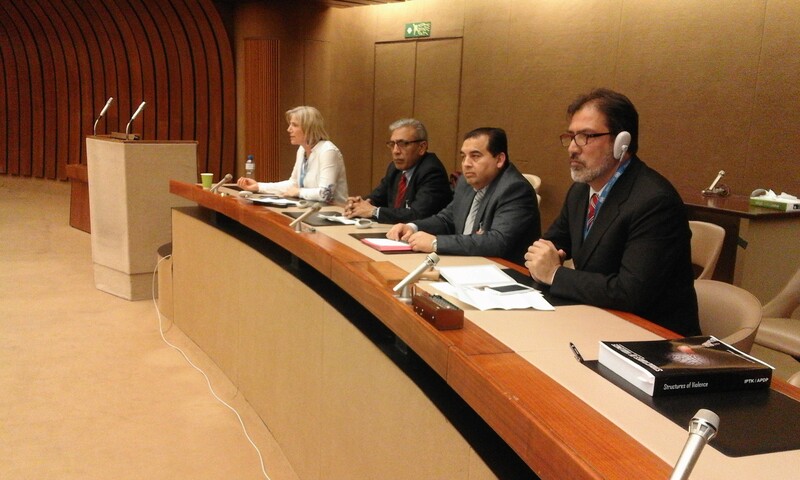 Kashmir Council EU's Chairman, Ali Raza Syed, said yesterday that Kashmir’s conflict needs the urgent attention of the international community, as it is a universal threat to humanity. We are compelled to see this as one of the most urgent calls for peace. He was addressing a seminar organised by World Muslim Congress at the sidelines of the 31st session of United Nation Human Rights Council (UNHRC) in Geneva. The seminar was moderated by Altaf Hussain Wani. Other panel speakers of the seminar were Dr Zahoor Manzoor, Member of the Brussels Parliament, Dr Karen Parker, Endre Barcs, Emima Abdusalam and Daniela Dongues. A documentary about the sedition charges against Kashmir Professor Syed Ali Shah Geelani was also screened. "We are compelled to see this as one of the most urgent calls for the peace. We believe that justice should prevail on power. "I am not going to narrate here the history of Jammu and Kashmir, nor will I refer to the numerous calls from the UN or international human rights organisations during the last seven decades. Rather I will only say that every human life lost in this conflict, every woman raped, every injustice committed is the injustice done to more than one and half billion people of India, Pakistan and entire South Asia. This is the unfortunate region that has been held hostage of this conflict for seven decades. This is the region that is lurking under extreme poverty, decease, illiteracy, bad governance, corruption. This is the region whose states are compelled to spend their meagre resources in building large armies and lethal armaments including missile and nuclear programs. "About the issue of mass graves in IHK, more than 10,000 innocent people have been disappeared. I want to raise a simple point of common sense. And this relates to Indian government’s refusal to conduct DNA tests. At one level, they claim that everybody killed by Security Forces was a militant or an outsider. Well, proving their identity, by DNA tests, shall only strengthen their claim beyond doubt. "We become sad and agitated to see that our fellow Kashmiris suffering from Indian occupation are still deprived of the basic notions of dignified life with right to choose, right to life and right to move, right to fair trial, freedom from torture, freedom from fear and freedom from inhuman treatment, amongst other inalienable rights and freedoms being enjoyed by the rest of the world at various degrees. "In my lifelong struggle for the right of self-determination for Kashmiris, I don’t remember a single year without a fresh reason for concern, a new act of horrendousness by Indian state. For the years, we have been agitating against mass graves, black laws and the impunity of the state officials. Today even the people of India are starting to say that the Indian occupation of the state of Jammu and Kashmir is illegal. JNU Students and professors came out to support the basic rights of the people of Jammu and Kashmir. "I hope that more and more of the people of India will support the rightful struggle of the people of Jammu and Kashmir. "Now is the time that the international community and the United Nations should implement the resolutions passed by the UN Security Council some 60 years ago, which gave the people of Jammu and Kashmir the right to decide their destiny in a plebiscite." Referring to a UN resolution, he reminded the assembly that on 21 February 1957, the United States of America, co-sponsored by the United Kingdom, Australia, Colombia and Cuba, raised the issue of Kashmir at the UN Security Council. The United States was one of the five co-sponsors of the Security Council Resolution 123 of 21 February 1957 that reasserted the call for a plebiscite, and declared that the Kashmir Constituent Assembly’s vote in 1954 to reaffirm the state’s accession to India was not internationally binding. Delegates voted 10-0 in favour of the resolution a few days later. Despite such resolutions, the people of Kashmir are still waiting to exercise their rights and freedom along with everything that is guaranteed in the United Declaration of Human Rights. He said, "We urge the Indian and Pakistani states to muster the courage to implement UN resolutions which guarantee the right to self-determination. But we know that it is not possible without active support from the international community. Now it is time for the international community to raise their voices, and for the UN to implement its resolutions to end the long suffering of the people of Jammu and Kashmir."